Baked risotto, a creamy-textured rice dish, takes a bit more than an hour start to finish, but making it takes very little hands-on time. While it bakes, you just need to stir it every 15 minutes or so, instead of the traditional stovetop method of stirring practically constantly for quite some time. 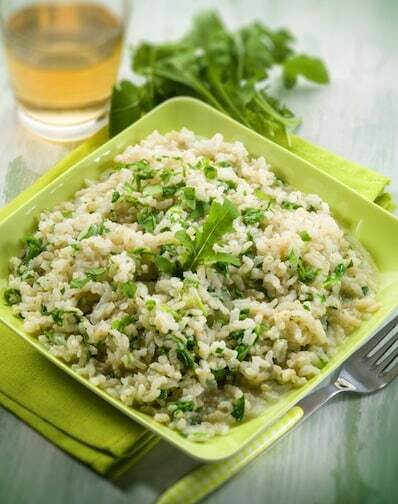 Arborio rice (available in the rice section of supermarkets and Italian groceries) isn’t a whole-grain rice, so it’s good to bolster this with lots of veggie additions, as suggested below the recipe. Adapted from The Vegetarian Family Cookbook. Baked risotto, a creamy-textured rice dish, takes a bit more than an hour start to finish, but making it takes very little hands-on time. While it bakes, you just need to stir it every 15 minutes or so, instead of the traditional stovetop method of stirring practically constantly for quite some time. 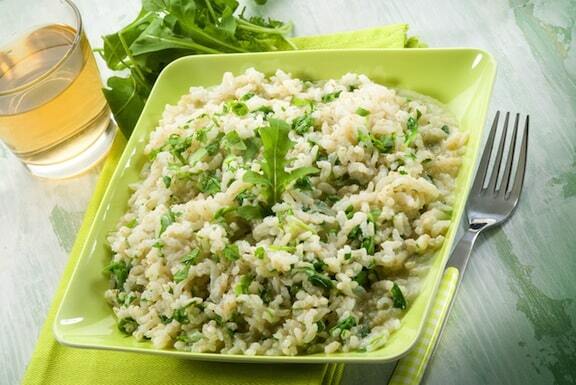 Combine the rice with the broth and the garlic in a two-quart casserole dish. Cover and bake for 1 hour, stirring every 15 minutes. At the third stirring, stir in one more cup of water. When done, the rice should have a tender and creamy texture. Season with salt and pepper, then let the risotto stand, covered, for 5 minutes or so. Stir in any of the additions suggested below, or use them for topping. Here are some wonderful ways to dress up baked risotto. You can stir these into the risotto once it’s baked, or use them as toppings. Try some ideas of your own; it’s hard to go wrong! Casseroles And Other Comfort Foods. I know risotto is pretty much exclusively made with Arborrio rice but do you have any idea how this particular version would do with plain ol’ brown rice? April, I’m not sure how well it would work with brown rice, though it could be interesting. Not sure how the unhulled grains would absorb the broth, though it may be worth a try. It would be more like a rice casserole rather than risotto…if you try it, let us know how it works out! I made this for a ‘solstice’ celebration meal. I was a little doubtful midway through that all the the broth was going to be absorbed but when a I pulled it out it was perfect! I added a bit of saffron and carrot to the bake and then sauteed some eggplant, onion, celery, carrot, yellow pepper and artichoke in olive oil to top the risotto. This turned out fantastic. So easy and absolutely delicious! Thanks for sharing! Jerry, sorry for the delayed response. So glad you enjoyed it, and I love your tweaks! What type of herbs do you suggest would be good? Jenny, that’s a really good question. I should add that to the recipe. Fresh parsley would be the best, as well as oregano, basil, or thyme. Dried would work, but fresh would be even better.